Price Range £129 - £130Price RangeSimply drag the slider bar to set your price range. 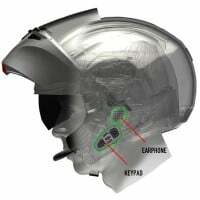 The AGV Share Bluetooth communication system has been specifically designed to fit Share system ready AGV helmets. This side fitment system is for the compatible full face helmets listed on the below table. Features of this system include wireless GPS and / or mp3 connection (mp3 connection can also be achieved with a wire). If listening to your favourite radio station is more your thing, you can tune in via the units built-in FM antenna. Any wireless connections will be dropped should your phone ring to prioritise the phone call, the unit will auto adjust the volume depending on the ambient noise levels. Electromagnetic emissions around the head are just 2.5mW; which is a massive 97.5% reduction over previous models. The unit is waterproof and firmware updates are available to download when available.